I wanted to point you to a post on the GOV.UK Verify blog that you might have missed. It talks about the programme’s objectives, and how the team has been making progress to meet those objectives. Take a look at that post, and note the GOV.UK Verify success rate: in 6 months, it’s increased from around 40% to 69%, and it’s on track to hit 90% by next April. That’s iteration in action. I’ve only got a few days left in government, but before I go I wanted to take this opportunity to publicly congratulate the GOV.UK Verify team. You couldn’t go out and buy a team like this - it has to grow along with the service. It’s packed full of talented technical people who understand public service. Stephen Dunn, Pete Gale, Liz Sarginson, Todd Anderson and others, led at first by Chris Ferguson and now by Janet Hughes, have done great work. They’ve built something brand new and completely unique - no other country in the world is as far ahead on identity assurance as this, and that’s because of the hard work and dedication of everyone on the team. I don’t use words like “dedication” lightly, either: these people are properly dedicated to building an identity assurance system that does what it needs to do, and meets user needs. Our strategy has always been delivery, and this lot have delivered in spades. GOV.UK Verify is important because of the things that make it unique. It’s been designed from the outset to be straightforward, secure and private. Government services can be sure that they’re dealing with the right person each time, and users can be confident that their personal information is in good hands, and not stored in a single huge database. That’s because GOV.UK Verify works via certified companies, who check and confirm someone's identity before they use a government service. This happens completely online, and it's the first time this has ever been possible. Previous methods have always involved waiting for something by post, or going somewhere in person. And it’s fast: it takes about 15 minutes the first time you verify your identity, and less than a minute each time after that. GOV.UK Verify changes the game because it piggybacks on the wider commercial market. More household names joining as certified companies in the near future will be a huge benefit to government. In the old world of silos, government was competing with itself and with the market. In the new world we’re working alongside it, setting standards but allowing innovation to thrive. Both sides benefit. This is one of the first times digital public services have worked with private companies in this way to make the most of both their expertise and the marketplace. All the certified companies have to meet or exceed high standards set by government and an independent certification body, as well as data protection laws and contractual obligations put in place to respect user rights and needs. Beyond that, they’re encouraged to develop the best solutions in the market for helping people prove who they are. It’s exciting to watch this happening. 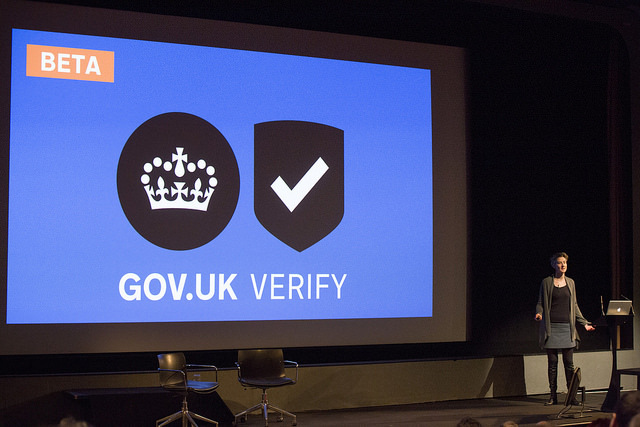 GOV.UK Verify is straightforward to use, but its market-based approach and technological sophistication make it one of the most forward-thinking examples of digital transformation I’ve seen anywhere. Other governments around the world are watching its growth carefully, and preparing to copy its template. It’s a fantastic success and over the next year or so, as it moves from beta to live, it’s going to have a huge impact. With nearly 300,000 users now, and having a successful roll-out in some of our most vital transactions like self-assessment in January 2015, GOV.UK.Verify has huge potential, and that’s down to the team and its users. Investment in GOV.UK Verify is investment in the future. It’s already verified 275,000 people, just during the beta phase. It looks set for rapid uptake and greater success when it goes live next April. A lack of trust in the identity of the user is one of the biggest barriers to digital transformation in the public and private sectors. If you can’t establish trust online, you are limited in the services you can offer digitally - not just filling in online forms which are then manually processed, but interacting with automated processes that give immediate responses and outcomes, so that you can complete your task and get the outcome you need there and then. In government we accept that we’re just one part of the market and ecosystem for identity, validation and assurance services. We can’t compete with such an emergent marketplace; instead we need outward-facing standards so everyone can service government, and operate to those standards ourselves. For years our identity management and validation systems have been siloed, lacking interoperability and burdened by locked-in data structures which are hard for us and users to change. This means more manual checking, more duplicate phone calls and forms to fill in. It results in a few contracts locking out the many emergent players in the marketplace. Continuing to work this old way - where we have 300+ parts of government talking to, and competing with, a digital marketplace - would mean turning our back on a crucial part of the digital economy. As it grows, GOV.UK Verify will mean that government can make more valuable and compelling services available as digital services, making them more convenient for users and less expensive for government to deliver. People will be able to check and update their details, and get access to automated, immediate services that are currently only available on the phone, by post or in person. And because of its market-based approach, the service is also helping to grow a new market for identity services to meet the same needs in the wider public and private sector, unlocking massive digital transformation opportunities in local public services, health services and the financial and retail sectors. That’s why GOV.UK Verify matters. And the team that has made it - against much scepticism since the end of the ID card approach - deserves huge credit for looking sideways: looking out and driving a market, and looking in and acting as one government. Well done to them. Follow GOV.UK Verify on Twitter and don't forget to sign up for email alerts. Do you think we will ever have a system like that exists in Scandinavia where there is an authentication called 'BankID'? It would be very handy to be able to only have one login everywhere. The downside is that one institution would have such a plethora of information. BankID is similar to GOV.UK Verify in that it involves using a 3rd party to access a range of services using a single account. However GOV.UKVerify is being built for central government services first, with the potential to expand to the wider public and private sector, and our certified companies come from a range of sectors, not only banks. GOV.UK Verify is a federated model - there is no single database containing everyone's data - users can choose which certified company to use. Once GOV.UK Verify is live, you'll be able to use you account to access a range of government services. We're exploring the potential use of GOV.UK Verify for health and local authority services too, through the Open Identity Exchange (oixuk.org). The Open Identity Exchange is also doing some work to explore the need for identity assurance in the private sector in the UK, which will help inform our thinking on whether some or all of GOV.UK Verify should become available for use in the private sector, too. Finally, we're working to make sure that UK services will be able to accept identity assurance from other European Member states, like BankID, and that other countries will be able to accept GOV.UK Verify identity assurance.